Gandhi’s life in South Africa, where he worked as a barrister defending the rights of the Indian community, is the subject of numerous scholarly works and articles. He spent twenty-one years of his life there, confronting an apartheid regime of strict racial discrimination, long before the authorities in Pretoria used the word ‘apartheid’ to describe their racially stratified society. His South African period is of especially relevance – why? This controversy around the Gandhi statue in Ghana arrives hot on the heels of a similar dispute that erupted back in March 2015 – Rhodes Must Fall. If that is case, should not Gandhi’s statue also fall? Did he not make racist comments and statement about black Africans during his time in South Africa? Did he not support the British empire, going so far as to work as a stretcher-bearer for British forces in their war against the Boers in the early part of the twentieth century? Gandhi himself created and joined the Indian Ambulance Corps for the express purpose of providing service to the British military forces during the Boer War. Mahatma Gandhi in the uniform of a sergeant as the leader of Indian Ambulance Corps. “If we look into the future, is it not a heritage we have to leave to posterity that all the different races commingle and produce a civilisation that perhaps the world has not yet seen. The non- aligned anti-colonial movements encompassed all races and ethnic groups for the common purpose of self-determination. One of the main exponents and practitioners of anti-colonial liberation was a black African political leader, Kwame Nkrumah – who lead his country, today known as Ghana, to independence. Nkrumah was a socialist and pan-Africanist, who derived inspiration from numerous sources. One of the sources from which he learned and drew inspiration was Mahatma Gandhi, whose doctrines of non-violence and non-cooperation profoundly influenced the Ghanaian anti-colonial campaign. It is obviously up to the authorities at the University of Ghana to decide whether or not to keep the statue of Gandhi on their campus. No-one can dispute that. However, rejecting Gandhi’s example would be a huge disservice to all those – from all races – who drew inspiration from the Gandhian model in their own anti-colonial struggles for self-determination. Since March 2015, Saudi Arabia, along with its Gulf State allies, has pursued a relentless bombing campaign and siege of the nation of Yemen, in order to influence the political order in that country. This Saudi war, which has targeted hospitals, schools, the electricity grid and civilian infrastructure in Yemen, has been prosecuted because of the fulsome military and political support provided to Riyadh by Britain and the United States. This forgotten war has been largely eclipsed by all the media attention on Syria. While American officials loudly and emphatically condemn the war crimes of Russian military forces in Aleppo, they have enabled their Saudi allies to commit atrocities on a national scale in Yemen with impunity. As the Common Dreams magazine reported, the Saudi-led air forces – whose warplanes are refueled by the United States – carried out an air-strike on a funeral hall in Yemen’s capital, Sanaa. At least 140 civilians were killed, and 500 were wounded. 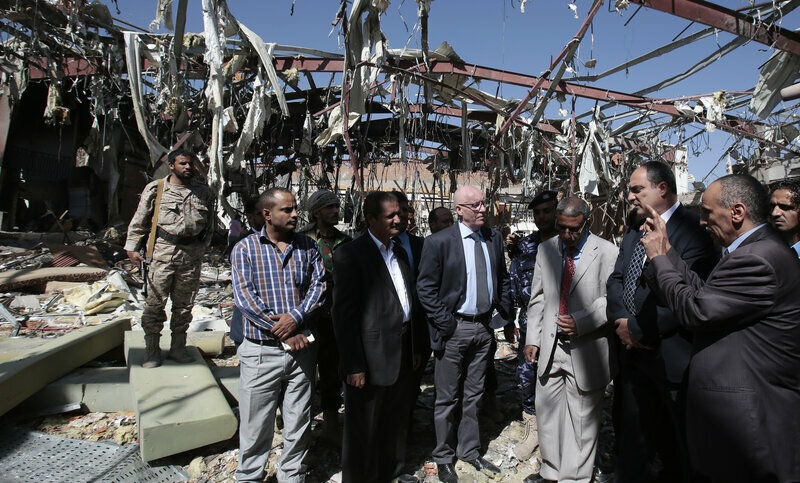 The Saudi aircraft struck that particular funeral hall because the attendees included high-level officials from the Houthi-led insurgent movement, the latter waging a long-term political and military struggle to achieve self-determination for Yemen. The air strike on the funeral hall procession represents a major escalation of the Saudi offensive against Yemen. In the Yemeni capital Sanaa, thousands took to the streets to protest this latest Saudi outrage. The leader of the rebel Houthi movement, Abdul-Malek Houthi, angrily denounced the attack, and stated that these kinds of airstrikes are being done with the weapons and permission of the United States. Such an attack constitutes a war crime, and questions are being raised in the United States about American culpability for this crime. The Saudi authorities announced that they would investigate this bombing, and denied responsibility. However, it is clear that the funeral hall attack is only the latest in a long string of assaults on hospitals, markets and places where large groups of civilians congregate. National Public Radio elaborated upon how the United States has become an indispensable partner for the Saudi Arabian government in its offensive against the Yemeni Houthi movement. The war was intended to be a quick and decisive victory over the rebellious forces, with the Saudis installing their Yemeni proxy, current President Abed Mansour Hadi, in power. However, the war has ground on for much longer than anyone anticipated, and the Saudis – along with their American and British backers – find themselves stuck in a quagmire of their own making. Abed Mansour Hadi, installed as President in 2012 as part of a Saudi and American sponsored agreement, is the preferred candidate of the outside powers. His installation was meant to reduce the political upheavals and revolutionary demands that led to the ousting of his predecessor, long-term Yemeni President Ali Abdullah Saleh. However, this peace process was artificial and superficial, with the Yemeni Houthis sweeping to power, taking over the capital and large portions of Yemen itself. Hadi was forced to flee to Saudi Arabia where he has remained ever since, despite an occasional and temporary foray by Hadi into the Yemeni city of Aden. While the United States involvement in the specific funeral hall attack is criminal, it is only one part of the wider role the US (and Britain) have been playing in enabling the Saudi regime to devastate the country and population of Yemen. The Common Dreams magazine published an article by C J Werleman called ‘The American-Made Catastrophe in Yemen’. In this article, Werleman draws attention to the fact that the United States provides billions of dollars worth of military supplies to the Riyadh government. US President Barack Obama has the dubious distinction of being the president that has shipped more weapons and munitions to Saudi Arabia than any of his predecessors – since 2009, Obama has provided 115 billion dollars worth of military equipment, training and supplies to the Saudi Arabian monarchy. The relationship between the Saudi and American governments has come under renewed scrutiny, not so much because of any qualms about the Saudi assault on Yemen, but because of American unease over the more egregious crimes of the Saudi war machine. Not only has Saudi Arabia waged an aggressive aerial campaign, but has also implemented a naval blockade of Yemen since 2015. Saudi forces stop and search any maritime traffic heading towards the Yemeni ports, and turn back any shipping. The blocking of sea ports has added to the misery of ordinary Yemenis, with millions facing the prospect of starvation. Food scarcity has hit the children of Yemen particularly hard, and it is apparent that a humanitarian catastrophe of epic proportions is unfolding in the war-ravaged country. Unicef has reported on the dire situation on the ground, and it is the Yemeni children that are paying the heaviest price. In these terrible conditions, it is unsurprising that diseases such as cholera have broken out in Yemen. It is noteworthy that American naval forces participate in this naval blockade of the country, and America has imposed financial sanctions of Yemen to interrupt the flow of goods and services to that nation. Britain and United States actively participate in intelligence gathering, provide targeting information and aerial refueling for the Saudi forces. American and British officers cooperate with their Saudi counterparts to coordinate attacks. The US Navy attacked and destroyed radar sites in Houthi-controlled areas of Yemen, after one of its warships was fired upon by missiles which the US claims originated from Houthi military forces. The Pentagon has signalled that it can directly intervene in Yemen, though that statement ignores the fact that the US has been heavily engaged in making the Saudi war on Yemen possible. Despite all of these forces ranged against them, the Yemeni Houthis have remained defiant and resilient. The Hadi government, while officially recognised, has only a very thin base of domestic support. As the Saudis, and their imperialist enablers, haemorrhage money and credibility as they are bogged down in this tiny nation of Yemen, the outside world must speak out. As the United States and Britain stand behind their Saudi mercenary, we, the ninety-nine percent, must expose the system that rewards merchants of death. What kind of economic and political system enables profiteering from human misery and death? When arms sales and political alliances with fanatical warriors leads to a nightmarish scenario of destruction and heartbreak, it is surely time to hold those responsible for such criminal wars to account.